There is no shortage of code generation techniques available in Visual Studio. There are even some neat PowerShell solutions that are based on the DTE. Let me show you an approach I’ve used a few times – it’s a fairly special case, but it’s one of those problems that requires a high volume of monkey code that I frankly don’t want to spend a lot of time on. It also demonstrates a few automation techniques you may not have considered before – such as driving other Visual Studio extensions like ReSharper. 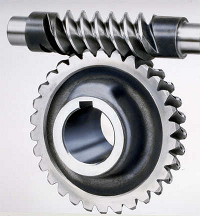 My hope is that it gives you some fodder for exploring your own creative automation solutions with StudioShell. The scenario: I need to take a COM interface and wrap it in a .NET class. Why? Long story for another post, but it has to do with getting PowerShell format definitions working for said COM interfaces. For example, I’ve recently been working on a PowerShell Provider around the Windows Task Scheduler. The Task Scheduler API is COM-based and consists of a handful of about 40 interfaces that need wrapping to work in my provider framework. 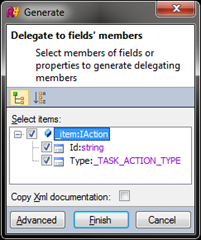 Use ReSharper’s Generate Delegating Members code generation feature to recreate the COM interface implementation in C#. And to be honest, I don’t write this code – I use ReSharper to generate it for me. I hit [alt]-[insert] and ReSharper pops up a list of code generations it can perform on the class, and I select Generate Constructor, and it does the magic for me. Once the basic class and field code is in place, I turn again to my second-favorite Visual Studio extension. ReSharper ships with a badass function called “Generate Delegating Members” that does exactly what the name implies – it can generate method and property calls that forward to a class member. Rocket science it ain’t. Still, I have about 39 more of these things to create. Time to automate. Heh. Poetry. Cool. Now we have the list of interfaces we need to wrap. Let’s start hacking. For each interface in $t, I derive the class name using the same replace logic I used in step 1; I store this class name in the variable $c (line 2). My current location is the code model for the test.cs file, so I can use this class name as a relative path to the new-item cmdlet to create class members. In lines 3-6, I do just that to create a private field named “_item.” The type of field _item is set to the name of the Task Scheduler interface being processed. Now things get interesting. I need to add a constructor that initializes the value of the COM reference. I used ReSharper to do this before, but there’s no way to automate ReSharper is there? Um, yeah, there is. All Visual Studio extensions (and Visual Studio itself) expose handles to their functionality in the form of Command objects. StudioShell dutifully exposes these commands as part of the DTE: drive. If we can find the command, we can pass it to the standard invoke-item cmdlet to make it run. Hmmm, I’m not a betting man, but I’d still put money that the ReSharper_Generate_Constructor command is the one I’m after. Now, a little Visual Studio SDK sidebar – when a command executes, it uses the context of the current user activity. In the case of this particular ReSharper command, it will only execute successfully if I’m currently in a code editor window working on a class. Moreover, I need to move the cursor to the class I want the command to operate on. Starting to sound like more trouble than its worth? Fear not grasshopper – StudioShell has your back yet again! One of the newer features of StudioShell is the ability to “navigate” to specific code model elements using the invoke-item cmdlet. This is a recent feature that will be available in the upcoming 1.2 release. 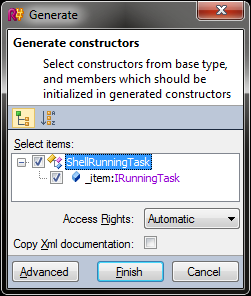 Line 1 isolates the classes in test.cs; each class code item is first “invoked,” causing the containing document to activate and the cursor to move to the class code (line 2), then the ReSharper Generate Constructor command is invoked (lines 3-4). The result – the ReSharper Generate Constructor dialog is opened once for each class. Unfortunately there is no way I know of to automatically select what members to initialize and then dismiss the dialog. I’m sure there is, and I’d love to hear about it in the comments. But right now I’d rather be more done than smart. So, I hit [space]-[enter] 40 times like a schlep. One last step and I’m done. 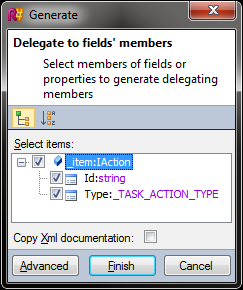 I need to run the ReSharper Generate Delegating Members command on each class. This isn’t that different from what I had to do in step 3, and since I’ve taken the mystique out of automating ReSharper I know exactly what to do. Well lookey what we have here… Hello there ReSharper_Generate_Delegating command! Prepare to be automated! The only thing I had to change was the name of the command. Again I get about 40 dialogs, one for each class, asking me what fields I want to create delegating members for, and as before I just type [space]-[enter] until the UIs disappear. … and it even builds (read: SHIP IT!!). 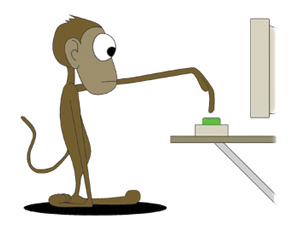 2500+ lines of monkey code created in 5 lines of powershell, all in all about 10 minutes of exploring. I’m automating my workflow, not my coding. That is, my focus is on replicating the activities I do manually in Visual Studio to yield the code I want in the end. In this case that means driving another automation tool. I’m not looking for fancy or even “best practice” with this, I’m looking for done. I’m not plotting a general solution I plan to reuse. Sure I’ll employ some of the techniques again, but it’s actually easier (for me at least) to treat each new workflow as a new automation opportunity. Moreover, trying to generalize this solution now would be a waste of time, since experience tells me that the next situation will be just different enough to force me to change my approach. I don’t focus on automation alone – that is, when I encounter a simple snag – such as the missing “using TaskScheduler;” statement in the code file, I just fix it by hand and move on instead of revisiting my automation technique to make it work perfectly. I’m automating something I’ve done manually several times. So I have clear expectations of what needs doing and the path to follow. My rule of thumb is not to automate until I can recite the steps I’ve taken before my memory. After wrapping up an iteration with a client, they returned to me with a new 300,000-line code base spread over about 200 (very messy) files. They were in the process of implementing a set of “corporate” coding standards and wanted some help getting their existing codebase to these standards. While it’s entirely possible to apply this standard by hand, the thought of scouring 300,000+ lines of code for properties that meet this criteria is not an attractive task. FxCop can probably find these properties for us, but it can’t apply a fix – that still requires human intervention. Best case scenario, I’m looking at days of mind-numbing monkey-on-a-keyboard work. Done. The total time it took me to complete the task across the 200+ files, including the necessary research, prototyping, and the full script execution: less than 30 minutes. My input focus never moved from the StudioShell console, and my hands never left the keyboard (except when the script was running across the code base, during which time I helped my kids study their math facts). This is why I made StudioShell – so I can scale iterative code and IDE solutions the same way an IT pro scales administrative solutions. If a solution can be applied to a single line of your code, StudioShell can be apply it to all lines of your code.